Ah Huat White Coffee are roasted for differing palates and for those who prefer to less sweet white coffee but with strong and rich coffee aroma. Special blended quality white coffee which is not too sweet with rich coffee aroma. 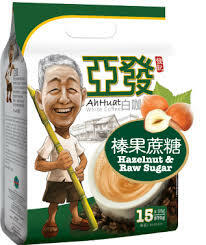 Ah Huat Hazelnut & Cane Sugar White Coffee is a perfect blended mixed with hazelnut and raw cane sugar. Packed with15 sachets in a standard packet, each sachet contains of 38g instant coffee powder. Place the instant coffee powder in a mug, mix with hot boil water then stir with a teaspoon until all the instant coffee is dissolved. Relax a day and enjoy the smooth & great taste white coffee anytime, any place you are. Don't just drink, Drink to taste ! Ground Arabic coffee contained in a sachet. Strong black coffee with no added sugar or creamer. Perfect for coffee lovers who enjoys savoring pure natural coffee goodness on its own. Looking for a healthier caffeine drinks ? 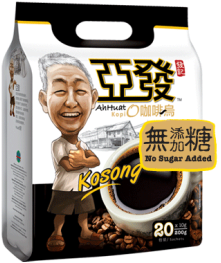 Here is a good choice for you and your family, Ah Huat Low Fat & No Sugar Added White Coffee is a special healthy blend with pure aroma for everyone. Packed with 15 sachets in a standard packet, each sachet contains of 20g instant coffee powder. Place the instant coffee powder in a mug, mix with hot boil water then stir with a teaspoon until all the instant coffee is dissolved. Relax a day and enjoy the smooth & great taste white coffee anytime, any place you like. Don't just drink, Drink to taste ! Ah Huat Gold Medal White Coffee is an excellent blend with selected high grade beans. 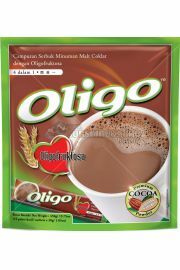 Packed with 15 sachets in a standard packet, each sachet contains of 38g instant coffee powder. Place the instant coffee powder in a mug, mix with hot boil water then stir with a teaspoon until all the instant coffee is dissolved. Relax a day and enjoy the gold medal white coffee anytime, any place you are. Don't just drink, Drink to taste ! Looking for a healthier caffeine drinks ? 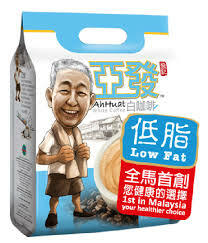 Here is a good one for you and your family, Ah Huat Low Fat White Coffee is a special healthy blend for everyone. Packed with 15 sachets in a standard packet, each sachet contains of 32g instant coffee powder. Place the instant coffee powder in a mug, mix with hot boil water then stir with a teaspoon until all the instant coffee is dissolved. Relax a day and enjoy the smooth & great taste white coffee anytime, any place you like. Don't just drink, Drink to taste ! A combination of freeze-dried coffee granules and coffee bean extract that retains the original quality and aroma of the coffee, with Oligofructose and Ginseng to enhance its taste and provide nutritional value.